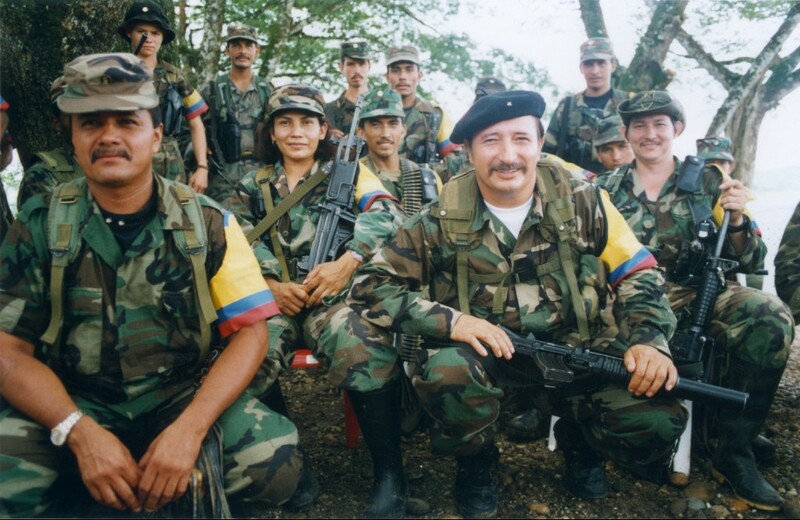 The FARC’s late combat strategist “Mono Jojoy” with his guerrillas in the “Distension Zone” in 2000. © Photo by Steve Salisbury. All rights reserved. Among the most important moments in my communication with FARC leaders was when we talked in-depth about the topics of a FARC possible unilateral “indefinite” cease-fire before one was declared—and to renew it after a resurgence of fighting—and of potential options which both the Colombian government and FARC could consider to deescalate the armed conflict. Driving factors were and are to save lives and foster a more conducive environment for the peace process. Citing those reasons, in the second half of December 2014, the FARC declared a unilateral “indefinite” cease-fire. While there were at least some 14 reported small-scale skirmishes, which the FARC claimed where defensive on its part, resulting in the number of killed or wounded in double digits, Pres. Santos said that the FARC had been complying with its unilateral cease-fire, and he ordered a suspension of first-strike aerial bombing against the FARC, as a gesture toward the deescalation of the conflict. But since early in the FARC’s unilateral “indefinite” cease-fire, FARC leaders were complaining to me about what they said were unnecessary, unrelenting, gratuitous “provocations” and incursions by the military into FARC areas—including some remote rearguard areas where the military had supposedly never gone before—and where they said the FARC was “not bothering anyone,” and that guerrillas had been killed. They said that if these “provocations” continued, they would be “forced” to fight back. The Colombian government view was different: With a Constitutional duty to uphold security in all Colombian territory and with a bilateral “definitive” cease-fire not in place, government troops were continuing (and continue) to go into FARC areas and respond to calls that the FARC was shaking down people (the FARC calls it “collecting taxes”), guarding drug-crops, or other complaints, as they would against any other outlawed group. And it wouldn’t be surprising if some gung-ho military officers wanted to get in their last punches at the FARC before the war ended, to try to burnish their own respective military careers. Whatever the case, some 11 soldiers of humble origins were reportedly killed in a FARC midnight attack April 14-15, 2015 in the La Esperanza/Buenos Aires area of southwestern Cauca department. Why the attack? The FARC claimed self-defense, as if it were a case of a person firing on an intruder in his or her home. And self-defense, in FARC eyes, could mean that if the Colombian military is attacking FARC units in one location, then the FARC can “counterattack” in another location “to take pressure off” the FARC units being attacked. But the news and images of the dead soldiers, who were sleeping at the time of the attack, outraged public opinion, and the FARC unit’s premeditation of the attack was clear. Some wondered if coca farmers and others depending for their livelihood on the illicit drug trade in that area were wanting the FARC to “do something” to stop incursions by the Army and police against the drug cultivations and installations there, and if this might have had anything to do with the FARC unit’s attack. Pres. Santos went to the airwaves to announce a resumption of first-strike aerial bombing against the FARC, and on May 21, 2015, a military air strike hit a FARC encampment near Guapi, Cauca, and reportedly killed 26 guerrillas, including FARC member “Jairo Martinez” who had participated in the Havana talks. The FARC responded by declaring an end to its unilateral cease-fire, which it said it had been continuing despite the FARC attack that had killed the 11 soldiers. During the next two months, the FARC launched at least 145 attacks comprising of harassment, ambushes and sabotage, killing some 22 government troops and two civilians, according to the Colombian think tank CERAC. Another Colombian think tank, IDEPAZ, reported 109 FARC attacks during that period, with 18 against the oil infrastructure and 16 against the energy grid. As clamor grew nationally and internationally to deescalate the conflict, the FARC renewed its unilateral “indefinite” cease-fire July 20, 2015, which it has held to this day, and Pres. Santos re-suspended first-strike aerial bombing. From reading my reports before the FARC attack that killed the 11 soldiers in Cauca, one would see the urgent, grave warning signs of the highly dangerous, explosive situation building. What the FARC leaders were complaining about to me was a worry they had before they started their unilateral “indefinite” cease-fire. As I noted in the February 8, 2015 report: “The FARC’s peace negotiators had the worry back then [as they expressed to me before launching a unilateral “indefinite” cease-fire] (and even now to some degree) that if they did (and are now doing) an indefinite unilateral cease-fire, then it could expose FARC troops to being slaughtered, to losing ground militarily, to lessening the pressure on the Colombian government to take the FARC seriously in the negotiations, and eventually to causing atrophy in FARC ranks. (Keeping up offensive combat operations keeps a guerrilla movement sharp, they would say. )” I answered these FARC questions point by point, stressing the humanitarian benefits, the boost the peace process would get, and that facing risks for peace—in a sincere, thoughtful, responsible way—is an act of courage. “The FARC’s self-declared indefinite, unilateral cease fire is in serious jeopardy. I mentioned this in previous e-messages to you, but it is literally in the midst of even more fire now. I met with a Colombian Army [ ] colonel Easter Sunday afternoon, whom I have known for 17 years, and he directly handles combat operations. This colonel told me that there is still intense fighting between the military and the FARC in several regions of the country, and that the Army has suffered quite a number of killed and wounded (mostly from mines and snipers). Publicly, the Colombian Def. Ministry says that three soldiers were killed in the past month. The FARC’s peace negotiator [ ] told me that the FARC has suffered over 10 or 20 KIAs since the cease fire. “Whatever the case, the fighting is increasing, say separately the colonel and the FARC. The colonel says that while Pres. Santos has suspended first-strike bombing of FARC targets, if the FARC fires upon the Colombian government troops, then air support can be called in to attack the FARC. A possible upshot of this is that the Colombian military can use this clause (loop hole?) to try to draw FARC gunfire by the military or police using ‘recon by fire,’ and then calling in air strikes against the FARC. “That said, just the suspending of the ‘softening up’ first-strike bombing has affected government military operations, says the Colombian colonel. ‘I am not going to risk the lives of my soldiers on some tough targets without bombing support first,’ he told me. So, why not a have a formal bilateral cease-fire now? The FARC has been calling for it, an “armistice,” since the start of the peace talks, to happen as the talks take place. But the government position has been for it to happen as a “definitive” act to end the conflict and hostilities. Pres. Santos’s concern is that if a bilateral cease-fire is not “definitive” to end the war, the FARC could abuse it to refortify itself for an “armed peace,” gain strategic advantage and drag out peace talks indefinitely; and if the talks were to fall apart, the FARC would be stronger to renew its fight. Moreover, Pres. Santos would not want to see the political opposition trying to spin a non-definitive bilateral cease-fire as a kind of supposed follow-up to former president Pastrana’s failed peace talks’ Switzerland-sized “Distention Zone,” which Pastrana had ceded to the FARC from January 1999 to February 2002, when Pastrana ended the talks, citing FARC violations. Colombian then-Pres. 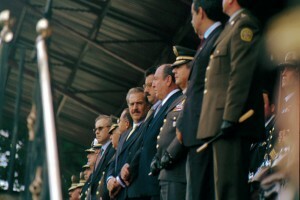 Andres Pastrana at a police ceremony in Bogota. Pastrana allowed a Switzerland-sized “Distension Zone” to hold ill-fated peace talks with the FARC from 1999 to 2002, when Pastrana ended them. © Photo by Steve Salisbury. All rights reserved. Pastrana’s job-approval ratings plummeted to among the lowest levels ever polled for a sitting president, as critics shouted that the FARC had constantly abused the “Distension Zone” and turned it into a safe haven to grow by up to some 60%, to refortify itself, to hold captives, to execute its enemies, to benefit from drug cultivations, to use as a staging ground for attacks, and to host freelance instructors who were reportedly active members of Spain’s armed separatist group ETA, former members of the Irish Republican Army, or other “internacionalistas” regarding urban combat and explosives training. The FARC was fed-up with Pastrana, too, saying that Pastrana fumbled the FARC’s olive branch of peace and duplicitously used the peace talks for Plan Colombia to take root and expand and modernize the Colombian Armed Forces and police. The FARC cited an economic recession of historic proportions during Pastrana’s presidential term for helping the FARC to engross its ranks—although Pastrana denounced FARC attacks as undermining the economy. And the FARC blamed its enemies for sabotaging the talks. Pastrana, whose image hasn’t completely recovered to this day, argues that his good-faith peace efforts unmasked the FARC as being triumphalist and not ready for peace in a reasonable way then, and that he bequeathed his Plan Colombia to his presidential successor Alvaro Uribe to push back the guerrillas. Trying to spin a full bilateral cease-fire as a Pastrana-like “Distension Zone” would be like trying to fit squares into circles, because the “Distension Zone” was not a bilateral cease-fire, but an area demilitarized of government troops for the purpose of having peace negotiations. But the FARC’s unilateral “indefinite” cease-fire now seems to have practically evolved into an undeclared “bilateral” cease-fire, though still precarious not having a panoply of verification and protective mechanisms that the United Nations via CELAC countries is set to provide upon the signing of an overall peace accord or shortly after. A Western official who interacts with the Colombian Armed Forces and follows the peace process told me that the Colombian military hasn’t been launching offensives now, and that to do so, an order has to come directly from Pres. Santos. “It is basically an undeclared cease-fire,” this official, who prefers to remain anonymous said, though Pres. Santos and his government officials may not view it that way, or at least not say so publicly, if they privately did.